Japanese design is known for its mix of natural materials and clean, well-defined shapes. This fits well into the modern minimal aesthetic, where materials and colours are highlighted through space and geometry. The use of natural timbers, environmental interaction, and clean functional minimalism is very attractive to the busy western mind. Traditional Japanese houses are focused on space rather than possessions, with only a few functional and decorative items needed to accent living spaces. The Japanese are also well known for their craftsmanship and attention to detail, with sophisticated wood-working techniques and other skills often passed down through the generations. When fewer items are used to decorate interior spaces, more attention needs to be given to each individual item. Much of the skill of Japanese craftsmanship is about embracing the inherent qualities of natural materials, with the placement of furniture and other items based on the functionality and geometry of the surrounding room. 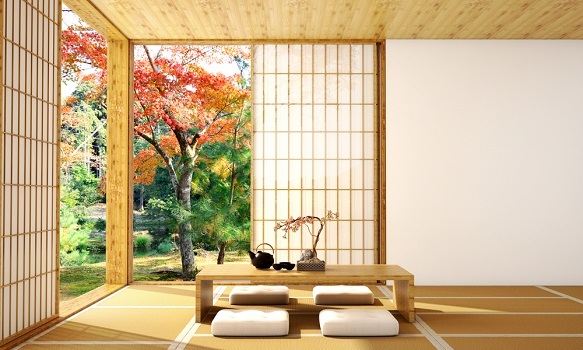 The Japanese concept of kanso, or simplicity, can be used to understand this approach to interior design, along with the other six principles of the zen philosophy: fukinsei or asymmetry, seijaku or silence, shizen or naturalness, koko or austerity, datsuzoku or freedom, and yugen or subtle profundity. Much like zen itself, kanso focuses on the flow and movement of energy within a space. By choosing modest furniture and minimal artwork over large and bold designs, perhaps we can help to quieten the western mind and enjoy the peace that we all crave. While much of this approach is philosophical in nature, there are a few traditional items and design elements that symbolise the zen aesthetic. For example, sliding doors and screens are often used to create separation between spaces in Japanese homes, or alternatively open spaces up to allow the energy to flow. Louvred doors and translucent screens allow light and shadows to travel between spaces, which provides a sense of connection and warmth even when rooms have been separated. Tatami flooring is a type of straw matting that is often used underfoot in Japanese houses, with this simple and environmentally friendly solution designed with bare feet in mind. The use of multi-purpose rooms is another feature that defines Japanese interior design, with traditional futon beds often folded and stored in closets during the day to make additional living spaces. This is a great way to make the most of small living spaces and create a spacious zen atmosphere that is also functional. Easy access to the outdoors and minimal transitions between indoor and outdoor spaces is another key feature of Japanese design that continues to influence modernist architects around the world.